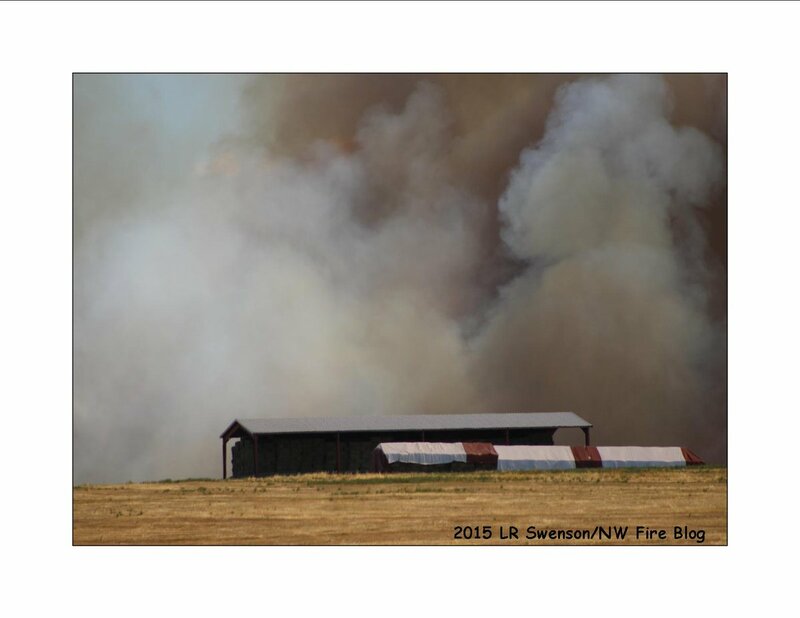 SOAP LAKE, Wash. – Regional resources from local, County and State from across the State of Washington descended upon the fire line on Tuesday when a large out-of-control brush fire turned wildfire broke out near Soap Lake on Monday, June 11, 2018. Overtime with all resources joining forcing now have the SOAP LAKE FIRE under control and almost fully contained. Fire Mobe resources were released earlier today after being briefed. Here is a timeline of how fast-moving this wildfire prompted local and later, State Fire resources to e deployed on this incident. 0800 PDT | Fire crews were back on the fire line working on strengthening and hold the containment lines. Firefighters on night fire operations reported some smoke and hot spots inside the fire perimeter. Day fire operations were tasked with new replacement firefighters focus on putting out hot spots and patrolling for any other areas of concern. All Evacuations orders/notices have all been lifted. 2000 PDT | Firefighters completed construction of containment lines and were able to keep the fire within the established perimeter. Strong winds were in the forecast today and arrived on the fire line making it a challenge for firefighters this afternoon. All resources are beginning the stages of demobilizing and fire command will be terminated/when all resources have gone back into service are due to occur on Thursday, June 14, 2018. The fire is said to have destroyed 2,063 acres and is at a 90% containment status. No new fire growth was reported. 0045 PDT | Fire had been called many different names from Soap Lake Fire, High Hills Fire and MILEPOST 81 FIRE. State Patrol authorized the mobilization of fire resources at the request of Grant County Fire District 7. The fire was estimated to be at 1,400 acres with a 0% containment status. Homes, agriculture and power infrastructure was currently under direct threat. Level 3 and 2 evacuations were in effect. The cause is unknown and under investigation. Fire to be managed by the NE WA IMT Type 3 team. The State EOC was activated to a Level 2. 0216 PDT | Fire crews are working tirelessly on the wildfire. Several homes have been notified of the Level 3 evacuation. 0600 PDT | Fire name is changed from #Milepost81Fire back to #SoapLakeFire. Sheriff’s Office estimates fire around 2,000 acres with a 50% containment status. It is located 1 mile from town. Fire crews are between the town and the fire. Containment lines are holding. Manpower has been thin but they have successfully saved several homes. No firefighter or civilian injuries have been reported. No damaged or loss of structures have been noted. Cause of fire is under investigation and is unknown at this time. 1002 PDT | A strike team Walla Walla FD is also part of the State Fire Mobe deployment. 1058 PDT | Grant County Sheriff Office states the fire is not impacting any of the rec lakes in the area. SR 17 traffic is not impacted currently. The Smokiam RV Park in Soap Lake is open for business. Replacement resources are arriving all morning which they are to take over for the local resources that have been working tirelessly through Monday night into Tuesday morning. 1100 PDT | 2 Benton County Fire District #1 engines with a total of 5 personnel was sent as part of an area Strike Team. 1340 PDT | For Public Information Officers or PIO duty was being handled by both the Grant County Sheriff’s Office (initial part of incident) and with Command being assumed by the Washington State Patrol. 1730 PDT | The NE WIMT Team is currently managing the fire. 200 firefighters across Washington State. Incident Command Post or ICP and Fire Camp has been established at the City of Soap Lake Park. 1827 PDT | A brush fire was said to be burning near Road 25 NE and High Hill Road (aka Rd A NE), northeast of Soap Lake. No Sheriff or any other PIO was assigned to the fire incident. Local fire resources are pouring into the area. Unknown acreage or size. The ICP was established on Road A. 1842 PDT | Command on another brush fire notified Dispatch to contact the Fish and Wildlife Services as a fire was burning on their land around Mile marker 81 in Soap Lake becoming the MILEPOST 81 FIRE. 1953 PDT | Fire Command requests immediate response of Grant County Sheriff to issue mandatory evacuations eastside of Hwy 17, south of MILEPOST 81 FIRE, north of RV Resort. Fire appears to be going back inside the Canyon. 1958 PDT | While firefighters were fighting this fire, a person called to report (also known as a RP or reporting party) 9-1-1 to advise that the fire they were all on previously had fire on Canal Road was now said to be threatening homes on Canal Road x Corral. More fire units were being dispatched. 2004 PDT | A wildfire was said to be burning near Road 25 – NE and High Hill Road (aka Road A-NE), northeast of Soap Lake. Fire was reported to be heading east. No current risk to home or evacuations in effect. 2024 PDT | Grant County Fire Districts 3, 4, 5, 6, 7, 10, 12, 13 and Ephrata FD were deployed on this wildfire. Originally District 7 and 13 were on the call. Fire District #9 with Dozer 9 that began digging fire line around 0100 hours on Tuesday, June 12, 2018. 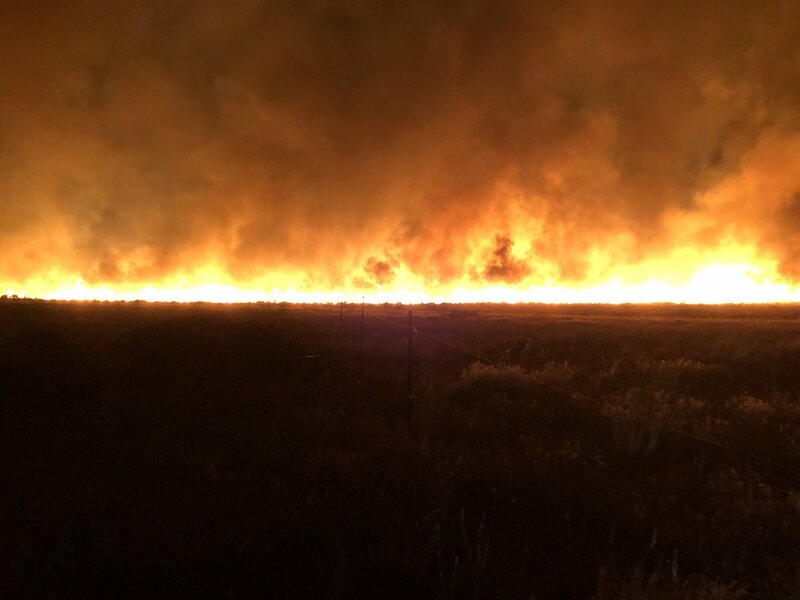 There have been quite a few wildfires that have hit this area, including several times we have gone firechasing and have up, close and personal with fire. Here is a historical overview of fire that has touched the Soap Lake area. June 1, 2018 (Friday) | A fire burned near Soap Lake due to a Farmer driving through a field while chasing a calf. 1,100 acres were destroyed. Also caused evacuations and damaged four buildings. 2015 | We did some firechasing that year and came across a fire burning in a field off of Hwy 28, near Soap Lake. This is one of our photos watching huge flames and lots of smoke billow up from near a hay storage area. Firefighters, equipment and air fire suppression resources came quickly and put the fire out. Exact date, acreage and who was deployed is unknown. May 25, 2012 | A wildfire broke out near Soap Lake is brought under control by firefighters.